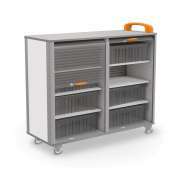 Organize your workspace with our mobile storage cabinets. 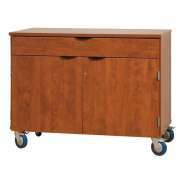 These heavy-duty cabinets are mounted on tough casters so you can move them wherever they will be the most convenient. They keep essential materials secure and out of sight, yet easy to get to when you need them. How should you organize a storage closet? Whether you choose metal or wood storage cabinets, the best way to organize the closet is according to personal preferences. Say goodbye to clutter with a proper space for everything. 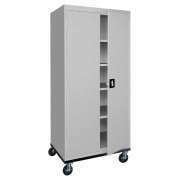 Our mobile storage cabinets will keep your classroom, office or work area looking professional and organized. 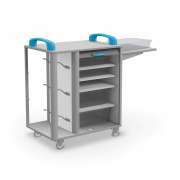 Do I really need mobile cabinets? 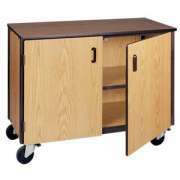 Mobile cabinets are super convenient, no matter what they are being used for. Whenever materials need to be relocated they can all be easily moved at one time. Gone are the days of individually removing cabinet contents, only to replace them when the cabinet is secured in a new location. 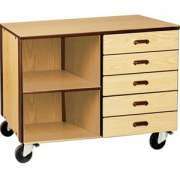 Casters make it easy to simply push contents from one location to the next without enlisting additional help or wasting precious time. 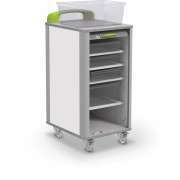 Mobility is especially valuable for materials that are often moved around such as art supplies and cleaning supplies. What kind of cabinet should I get? 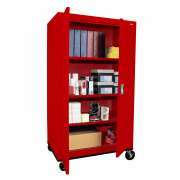 Once it has been determined that a mobile storage unit is necessary, there are many options to consider. Cabinet materials should be chosen based on their anticipated use. Wood has an attractive natural beauty that looks great inside a classroom or office. The stain can be matched to other wooden furniture so it will fit right in with the decor. There is also the option of particleboard with wood-style laminate finishes that have the appeal of natural wood. They don&apos;t call it “tough as steel” for nothing. Steel makes incredibly strong metal cabinets that are built to last for many years. In addition to its&apos; durability, steel is also very secure. 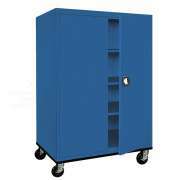 Steel cabinets come with a variety of lock variations including keyed handles or recessed locks as well as ones that accommodate a combination lock. A selection of both vibrant and more discreet colors will fit in just about anywhere. 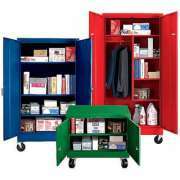 Who is the leading storage cabinet manufacturer? Hertz Furniture offers a wide selection of manufacturers. Each specializes in a different style. Our all-steel Sandusky Lee models are available in a variety of sizes and configurations to suit various applications. Ironwood Manufacturing offers cabinets in a huge selection of laminate finish hues that will suit just about any color preference. 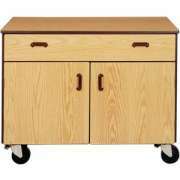 Wood Designs cabinets have a natural wood appeal and have tons of compartments for organized classroom storage. Should I get a cabinet with doors? 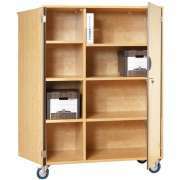 Mobile storage units are available both with and without doors. Open shelving keeps contents accessible, which is especially useful if many people need access to the materials they are housing. However, doors and drawers are also great because they keep contents hidden from view. If you choose a model with doors, options are available both with and without locks. 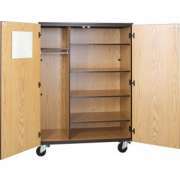 Non-locking cabinets keep contents hidden from view, while they remain accessible to anyone who needs them. The locking cabinet option is optimal for securing contents. If you are worried about different people having access to secured contents, many of the locking options come with multiple keys. What factors should I consider when purchasing storage cabinets? Hertz Furniture&apos;s huge selection of sizes and styles enables you to find a cabinet that will suit virtually any application. 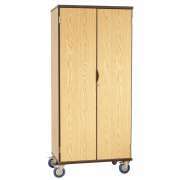 Tall cabinets are great for housing surplus supplies and valuable items. 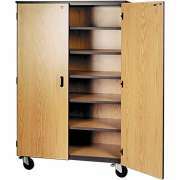 There are even wardrobe options available which give a teacher or executive a space to hang outerwear as well as auxiliary shelving. The shorter options are great for specialized applications such as filing and extra copy room or printer supplies. 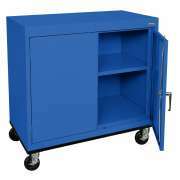 Mobile storage cabinets are available with shelves, drawers or both. Drawers are a great choice for papers and office supplies because they keep smaller items securely in place. Shelves are optimal for bigger items such as bottled products, electronics and accessories. Some cabinets come with a variety of shelf sizes, and some with uniformly spread shelves. Adjustable-height shelves accommodate evolving needs and irregularly-shaped items. 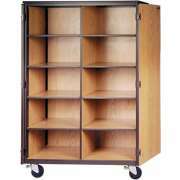 If you have a large library, mobile bookcases can really come in handy. 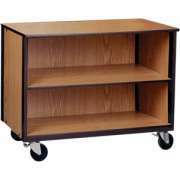 They enable you to move your library around with minimal effort and no strain. This is especially helpful in a school library where teachers might request that full collections of literature or reference books be brought to their classrooms. With bookshelves that can easily be moved around, making sure that the right resources are available to students when they need them is much easier. 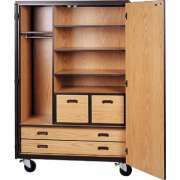 No matter what you need to store, Hertz Furniture has excellent mobile cabinet choices for you. From big items to small, art supplies to cleaning products, outerwear to electronics and beyond, our huge selection is sure to house plenty of options that will suit your requirements. The convenience of mobile storage won&apos;t diminish over time, and neither will your purchase. When you buy from Hertz Furniture, you get the added bonus of an extended warranty on many items as well as complimentary design planning services.